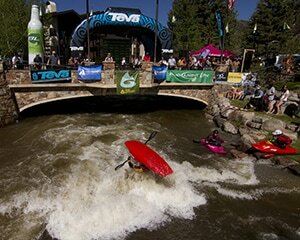 Town of Vail built a Whitewater Park in 2001 to create an event venue for kayak competitions. In 2004 Vail retained RiverRestoration to improve the original park performance and meet the expanding skill level of professional freestyle kayaking. The most significant constraint was found to be the floodplain. RiverRestoration investigated the feasibility of numerous structural solutions that could improve whitewater without impacting the floodplain or compromising the RICD water right. Inflatable bladders were the selected alternative. Final design was prepared and advertised for bid. Bank work was complete in fall of 2006, and the second phase of installing the adjustable bladders was complete in fall of 2007. Spring of 2010 brought 100-year flooding to the park. The whitewater park was designed for the predicted forces of these flood events. The park did not sustain any damage and the floodplain did not have increased flooding, as designed. Many other locations in the Town of Vail were damaged by the significant flood. TEVA Mountain Games is a major economic generator for Vail in an off season. 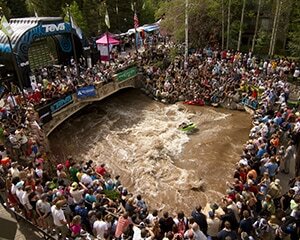 The Vail whitewater park is the centrepiece venue and the freestyle rodeo is the marquis event. RiverRestoration’s enhancements to the park doubled the high score potential and ensured the return of this economic generator. The proximity of spectators and the calibre of athletes creates a coliseum atmosphere and a close up of the spectacle. The project is immediately upstream of the Colorado Division of Wildlife Gold Medal designated fishery. Significant coordination with the CDOW was performed to ensure minimal construction impacts and continued fish passage.